Local and national veteran serving organizations, U.S. Department of Labor and Veterans Affairs announced the launch of a new coordinated network: SCServes – Lowcountry to support Charleston, Beaufort, and Myrtle Beach area veterans, service members and their families. Charleston, South Carolina (August 2, 2016) – A VIP ribbon cutting and keynote address from U.S. Department of Labor Deputy Secretary Christopher Lu was held August 2 at 11 a.m. (EST) at the Ralph H. Johnson VA Medical Center (VAMC) to mark the launch of SCServes – Lowcountry network, connecting the area’s human service providers to more effectively manage service requests from veterans and their families. The new network will enable service members, veterans, and their families to digitally access a comprehensive array of services, resources, and care through online self-referral, by phone, or in person at the Charleston based VAMC. While new to coastal South Carolina, the initiative is part of a broader national effort, AmericaServes, led by Syracuse University’s Institute for Veterans and Military Families (IVMF) with support from the Walmart Foundation which provides the strategy and resources for communities to better address the needs of service members, veterans, and their families. Through coordinated access to vetted service providers, SCServes – Lowcountry joins a portfolio of national partners that have connected over 3,722 veterans, service members, and military families to more than 6,300 types of comprehensive services in less than two years. Read Charleston VA/IVMF blog on SCServes Public-Private partnership. Brigadier General Gary Profit (USA, Ret. ), senior director of Military Programs at Walmart, reinforced the importance of organizing local services, resources, and care for veterans and their families. “It’s exciting to think that a company started over fifty years ago by an Army Captain, has grown to the place where it can help shine a light on those who served,” said General Profit. “We are very proud that the program we helped launch through the support of the Walmart Foundation in Charlotte last year in collaboration with IVMF, Accenture, and Unite US, is now expanding across both of the Carolinas – home to 1.2 million veterans and some of America’s greatest military bases. Lives are being changed for the better—not by reinventing the wheel, but rather making the wheel turn smarter,” the General added. 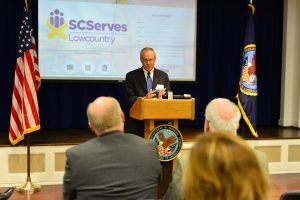 Local nonprofit Military Community Connection (MCC) will coordinate the SCServes – Lowcountry initiative and is further enabled by a state of the art software platform delivered by Unite US, a veteran-owned and operated technology company. Under MCC’s leadership, SCServes – Lowcountry network providers can enter and track referrals, coordinate service delivery, manage shared outcomes, and drive accountability amongst network members. Shared data sets, standardized measures for wait times, outcomes, and customer satisfaction are what set this network apart from others. 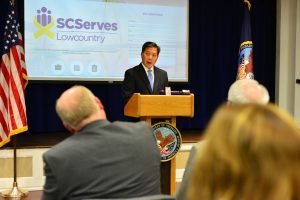 The SCServes – Lowcountry network will coordinate services for veterans and military families across nine South Carolina coastal counties including Berkeley, Charleston, Dorchester, Colleton, Beaufort, Georgetown, Jasper, Hampton and Horry. These counties are home to over 120,000 veterans, which comprise more than half of South Carolina’s total veteran population. Over 40 federal, state, local government and nonprofit veteran service providers will participate as network providers. Offering a true ‘no wrong door’ approach, the SCServes – Lowcountry Coordination Center – MCC – will be available by calling a toll-free hotline 1.855.355.1200 with licensed professionals standing by. Alternatively, veterans, service members, and their families can submit their request directly through the SCServes – Lowcountry website at www.scserves.org. “Community participation is paramount to ensuring that we develop a true, collectively designed network that is tailored to meet the needs of South Carolina area veterans, transitioning service members, and their families,” shared Dr. J. Michael Haynie, Executive Director and Founder of the IVMF and Vice Chancellor for Veteran and Military Affairs at Syracuse University. “We are hopeful that what is being done here in the Lowcountry can serve as a template for other regions just like our first North Carolina network in Charlotte has become a national model for helping veterans and their families successfully navigate the complex world of benefits, care, and services.